How much does self storage cost in Sydney? Well, that’s the big question, is it? Don’t take this the other way but, the fact that you are asking for the cost is a good indication that you must be looking for a good bargain. And also, that you’re either new in Sydney, or you might’ve been here for a while, but never tried mobile self storage Sydney before. If either or both is your case then you have found the right site to help you out! You can take the time looking around but there is no better deal than what we have. If you find any facility that is cheaper then we’ll beat their price by 10 percent! How’s that for a better deal? Now don’t get the wrong idea that since we offer a cheap price we’d compromise the quality of our work. That is never true. In fact, what we have instead is expertise in our trade. Which is how we’re able to provide such a great bargain. We know the workarounds of the industry and we use this knowledge to simplify and minimise the cost of the overall process. Ergo, in a way, it’s easy to conclude that when you talk about how much does Self Storage cost in Sydney, you only need to check how much does it cost in Macy’s. Because we practically have the most affordable services in all of Sydney. Having said that, time to confront the big question. And answer how much does Self Storage cost in Sydney, by giving you a liquidation of how much does it cost with Macy’s. If the online calculator did not do the trick and you still are unconvinced how good is the bargain we offer, you may try to see the table below and see for yourself. 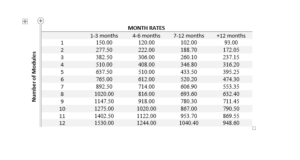 Below is the quotation of monthly rates services per module. The leftmost column is the number of modules. Then the rest of the columns are the prices you pay according to the duration period of your business. If you study the table carefully, you’d see that as the time duration increase, the lower is the monthly rate that you need to pay. Packing supplies can stretch your budget to a margin. If it’s your first time storing, then you need to learn early on how much can it affect your overall storage costs. You can’t just disregard its contribution to your expenses because they are an essential part of storing. And you’d really need them. Not to mention, if you don’t allocate your budget for packing supplies, they’d eventually end up as additional expenses and will screw things up on your budget allocations. For this reason, Macy’s took the initiative of helping you get a grasp how much you need to allocate for packing supplies. And we’ve got them available for you to include upon placing your order. In addition, you can trust that the prices of the supplies that we offer are affordable. This way, you’d never have to get surprise expenses due to packing supplies, you can already allocate some budget for them early on. We as a storing company is under the protection of Customer Goods in Transit and Storage insurance policy. And we are an authorized representative of Cowden (VIC) Pty Ltd (AFSL 245658). Which allows us to help you get yourself insured with the Customer Goods in Transit and Storage insurance policy. The policy will protect your assets. Or you can also acquire the insurance at your own expense. Getting your goods insured is very important. Because while you may have contractual rights against your self storage company, there are particular situations of loss or damage to your goods where they might not be held liable. We offer the best bargain that you can ever get for storing in Sydney. Stop wasting time looking around when you already found the most affordable deal in town. So, how much does Self Storage cost in Sydney? It’s as cheap as storing with Macy’s! Book your appointments today! For more inquires. Visit our website @xampp or call us @ 1300 40 90 69. This entry was posted in Storage and tagged self storage, self storage box, self storage module, self storage units.